The digital rights movement showed its strength this year by projecting influence in jurisdictions across the United States. Community organizations on both coasts, as well as the Midwest and the South, took action, promoting issues from net neutrality and civilian oversight of local police surveillance to the right to repair and digital security. Among the 84 groups in the Electronic Frontier Alliance, grassroots community organizations in many cities demonstrably improved public policy, while their allies elsewhere built awareness online, as well as in their local communities. EFF invites anyone seeking mentorship, guidance, or support to find a local grassroots network in your area, or recruit a handful of nearby allies to form a new group and join the Alliance in the new year. In Atlanta, Electronic Frontiers-Georgia mobilized to challenge a proposed computer crime law that threatened independent security research performed in the public interest. By chilling legitimate “white hat” security research, the law would have placed at risk millions of Internet users—from students to bankers—by criminalizing important efforts to identify and patch tech vulnerabilities before they can be exploited by malicious hackers. Frequent data breaches have recently impacted an expanding array of sectors, from credit rating agencies to dating sites arranging extramarital liaisons. As they consider potential responses, policymakers should consider predictable consequences that they might not intend, and commit to doing no harm. EF-GA ensured that state policymakers heard that message, by lobbying their state legislature, attending hearings to demonstrate grassroots concern, organizing and livestreaming a panel discussion, and mobilizing opposition from hundreds of Georgia residents and dozens of computer security professionals, including professors at Georgia Tech. Ultimately, the measure was vetoed by the Governor. Local organizers fear that another version will return next year, so they have already begun preparing their response. Meanwhile, groups in other major cities mobilized to challenge local police surveillance. Chicago advocates defeated a state legislative proposal that would have subjected protesters to drone surveillance. Recognizing that spying on protests threatens values enshrined in both the First Amendment (expression) and Fourth Amendment (privacy), local organizations including Lucy Parsons Labs raised the alarm, leveraging their longstanding work investigating police surveillance through public records requests. Their hard work helped ensure that the bill failed. Organizers have already turned their attention to a local proposal to extend police face surveillance across Chicago into commercial establishments, which would not only undermine privacy, but also violate a well-established and leading state law enacted to protect biometric privacy. Pursuing similar goals, allied grassroots groups in New York City continued to seek community control over the privacy parameters governing public wifi kiosks. They also advocated for transparency into NYPD surveillance, which recently expanded with the Department’s acquisition of a fleet of drones. Grassroots community organizations on both coasts secured legal requirements for civilian oversight of police surveillance, including (and beyond) the transparency goals at issue in New York City. In Oakland and Berkeley, California, as well as Cambridge, MA, local groups in the EFA mobilized and successfully advocated for these requirements, joining just a dozen communities across the country that have adopted similar measures in recent years. EFA allies in other cities, from St. Louis to San Diego, continue to organize support for local civilian oversight. Finally, EFA groups across California, from Access Humboldt in the state’s far north to techLEAD in San Diego, mobilized in their respective communities to help support net neutrality. By lobbying their respective state Assembly members, they achieved the passage of SB 822, a groundbreaking state law that—if it survives a federal pre-emption challenge—could set a model for other states. Many EFA groups working to promote digital rights did so from college campuses. For instance, Yale Privacy Lab organized a project to map the location of surveillance cameras around New Haven, CT, while also hosting workshops on applied digital privacy and advocating for campus libraries to host TOR nodes. Across the country, README at UCLA hosted monthly gatherings, including “cryptosocial” events at CRASH Space, a hacker space and EFA ally in Los Angeles. Other student groups, like the Hacking Club at San Francisco State University, and Hack UCF at the University of Central Florida, focused on competitive cybersecurity and hacking competitions, while sharing digital security tips and practices with classmates and other campus organizations. EFF has compiled several case studies examining highlights from across the Alliance. Many groups in the EFA have organized local workshops to inform their communities, and a handful have posted public resources online from which anyone can learn. Digital security workshops with public audiences have been a focus for grassroots allies from LA Cryptoparty to the CyPurr Collective in Brooklyn. EFA groups in Portland, Seattle, Fresno, Austin, St. Louis, Chicago, Philadelphia, Raleigh-Durham, Baltimore, and Orlando are just some of those who have offered their expertise to their neighbors. Many took advantage of EFF's Security Education Companion, a resource for trainers interested in helping others. Other groups have compiled video archives of their events, and in one case, a slideshow with guidance on leveraging public records requests to fight government secrecy and advance transparency. In Atlanta, Electronic Frontiers-Georgia collected videos from its many events at DragonCon, an annual cosplay convention in Atlanta where the group has hosted a track dedicated to digital rights since 2012. This year’s highlights included a session on the “Legal Risks of Security Research,” featuring current and former EFF staff. Groups in the Southwest have also collected video archives of their events. The Phoenix Linux Users Group posted video from a series of workshops, particularly exploring an array of advanced digital security topics. In Austin, EFF-Austin has also collected its events in an online video archive. The group organized the world’s first “Cyborg Pride Parade” this summer, and have begun planning their state lobbying strategy for 2019. Finally, Lucy Parsons Labs in Chicago compiled an online slideshow explaining best practices for leveraging public records requests. The group is led by a diverse group of young technologists and has developed a sophisticated online tool to advance police accountability while also conducting prolific investigations of local police. One led to its discovery of disturbing connections between the Chicago Police Department’s civil asset forfeiture practices and its funding stream for surveillance equipment used to spy on cellular networks, largely without civilian oversight. 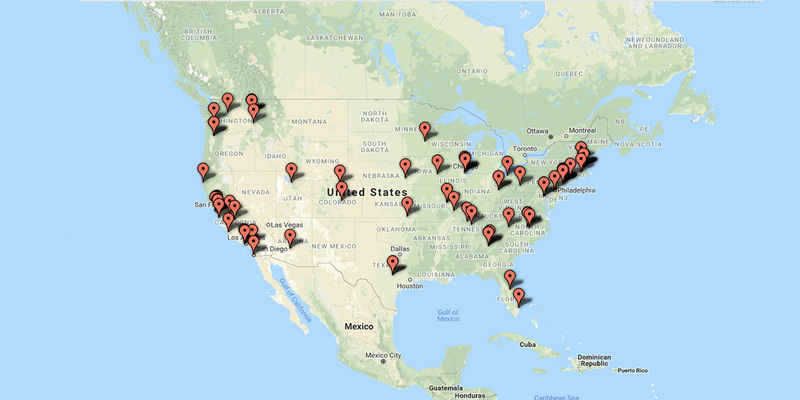 The Electronic Frontier Alliance brings together community networks in dozens of cities and towns across the United States. Each of them hosts public events, shares information, and builds local community among Internet users concerned about digital rights. EFF invites anyone seeking mentorship, guidance, or support to find a local grassroots network in your area, or recruit a handful of nearby allies to form a new group and join the Alliance in the new year.